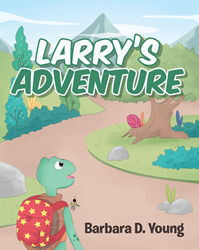 “Larry’s Adventure” from Christian Faith Publishing author Barbara D. Young is a sweet story of perseverance and friendship as a young turtle and his ladybug friend meet daunting challenges on their way to search for the stars. “Larry’s Adventure”: an engaging journey celebrating the wonders of the natural world for young readers. “Larry’s Adventure” is the creation of published author Barbara D. Young, a lifelong writer and resident of Dallas, Texas. “Larry's Adventure” is a story of a turtle named Larry and his faithful friend Hanna. Larry's quest to the mountaintop began with a falling star. As they traveled along their way they encountered a few challenges, yet the two friends forged ahead. Come along with Larry and Hanna as they journey to see the stars up close. Published by Christian Faith Publishing, Barbara D. Young’s new book is a charming adventure introducing a turtle names Larry and his faithful invisible friend, a yellow ladybug named Hanna. View a synopsis of “Larry’s Adventure” on YouTube. Readers can purchase “Larry’s Adventure” at traditional brick and mortar bookstores, or online at Amazon.com, Apple iTunes store, or Barnes and Noble. For additional information or inquiries about “Larry’s Adventure”, contact the Christian Faith Publishing media department at 866-554-0919.